Organic App Store traffic is a great source of installs for OLBG. So they decided to use A/B tests to improve their conversion rate and maximize store presence. Using SplitMetrics for iOS screenshots experiments, OLBG app achieved the impressive 61% conversion rate improvement. OLBG is a community of betting experts across a huge range of sports who share their tips with others helping to improve their betting. 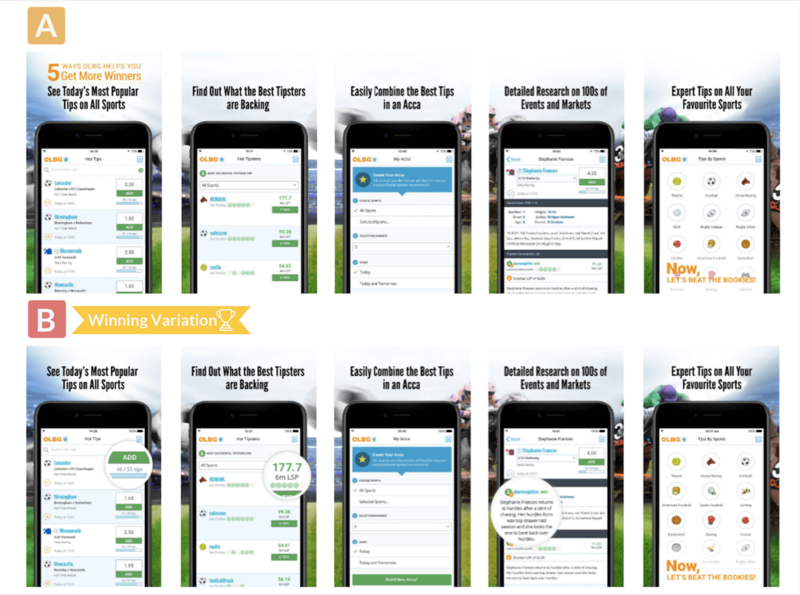 Since 2012, their apps make it super easy for punters to access the expert tips on the go and place their bets in a few taps. OLBG decided to use A/B testing to improve their iOS screenshots, increase conversion rate and maximize presence in the App Store as it was their biggest source of free organic installs. Another issue is that the majority of recommended iOS screenshots strategies are applicable to the games category and not betting-related applications. So the OLBG team wanted to test that recommendations with real, targeted audiences before uploading any changed iOS screenshots to the store. 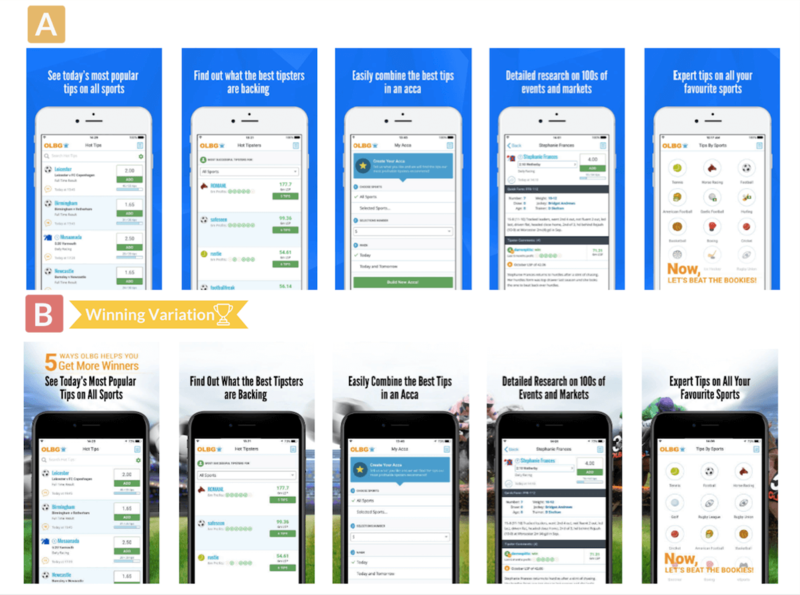 Jess who looks after the marketing at OLBG agreed to share the story behind the optimization of their iOS screenshots with help of A/B testing. We decided to start our optimization with perfecting our iOS screenshots. It seemed the logical place to start as iOS screenshots are considered to have the biggest impact on the landing page conversion. Furthermore, we were running Apple Search Ads at the time so iOS screenshots optimization could favor ASA performance as well. What concerns our initial hypothesis for the first experiment, we decided to check one of iOS screenshots trends. Lots of sources suggest that a plain background converts better than a busy background. Many of our competitors followed this advice and we had a plain background on our Google Play screens. The hypothesis was that a single color background would convert better as it doesn’t deflect attention away from captions and the interface of our app. It was a great idea to test the background of iOS screenshots first as it didn’t require much design time on our side and could have a big impact for minimal change. To our surprise, the iOS screenshots set with plain background performed 10-13% worse than the one with the themed background. It contradicted the industry trend but we were happy to get this insight into what works for our target audience. The results of the first test inspired us to keep on experimenting with our iOS screenshots. We decided to play around the interface depicted in the winning iOS screenshots set. Our hypothesis was that we would improve the conversion removing the headline text from the first screen to lighten it up and adding bubbles to highlight certain features of the app. This time, the hypothesis was confirmed with a very convincing 45% improvement. We also learned that people don’t often scroll past the 3rd screen to make their decision. So the first 3 iOS screenshots need to be really impactful and contain your app’s strongest features. Thanks to experimenting with iOS screenshots design and order we managed to achieve the significant conversion rate increase of 61%. With A/B testing, you need to be a couple steps ahead with each iOS screenshots test to prepare for the follow-up one. You must wait for confidence level 85%+ as the results can differ significantly in the latter stages. Before getting down to our experiments, we expected a bit quicker results but soon we learned that A/B testing is a gradual process and each step should be really thought over. Plus, the nature of our industry imposed certain limitations regarding traffic sources which made the process a bit difficult and lengthy at times. If you want to succeed in ASO, test, test, and test again. Storytelling videos don’t work in the betting vertical.